A pellet mill, also known as a pellet press, is a type of mill that is used to create pellets from a powdered or granular material. Feed mills commonly employ pellet mills, but less than 50% of the time. A pellet mill is unlike other types of “mills”, such as grinding mills, in that pellet mills combine material particles into a larger, homogeneous mass (a pellet), rather than breaking larger particles down into smaller pieces (what a grinding mill does). The pellet mill is either a flat die or ring die mill. Most modern pellet mills for feed milling are ring die mills. For a good review of the pelleting process please refer to this document. The pellet mill control system allows an operator to specify set points and monitor equipment. Mixed mash is transferred to the pellet mill from the mash bins. Automatic operation of the pellet mill is started from the human-machine interface (HMI) touchscreen monitor. The user selects a formula containing the pelleting process set points and parameters so the pellet mill PLC knows how to configure and startup the pellet mill properly. 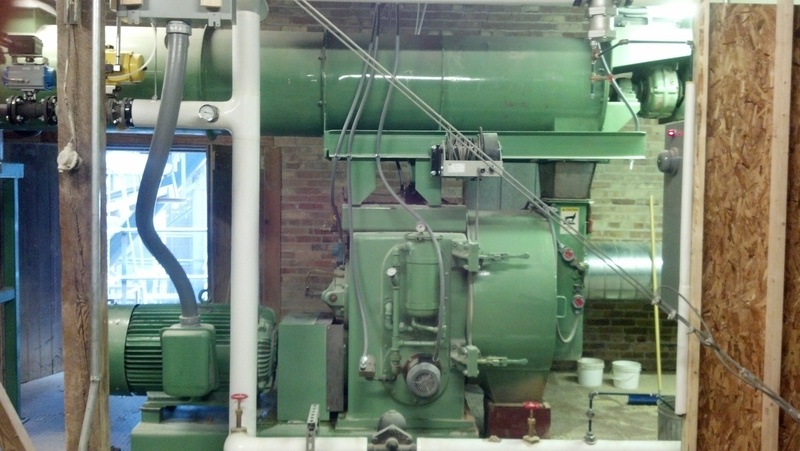 Pellet Mill shutdown overload time delay in seconds. Initial and Steady State Feeder adjust time delay in hundredths of a second. Initial and Steady State Steam adjust time delay in hundredths of a second. Mash bin gate open time delay in seconds. Mill motor starting delay in seconds. Mill motor startup alarm delay in seconds. Conditioner motor spin up delay in seconds. Conditioner motor startup alarm delay in seconds. Conditioner motor purge time in seconds. Collector Auger spin up delay in seconds. Collector Auger startup alarm delay in seconds. Feeder Auger purge time in seconds. Steam valve open time delay in seconds. Bin 1/2 Feeder Auger spin up delay in seconds. Bin 1/2 Feeder Auger startup alarm delay in seconds. Bin 1/2 Feeder Auger purge time in seconds. Bin 1/2 Discharge Gate activation alarm delay time in seconds. Operator places all of the equipment MOA (Manual/Off/Auto) switches in Auto. 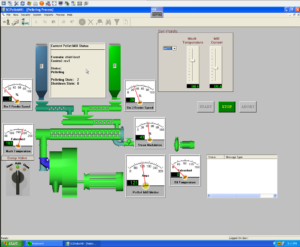 This can be accomplished by pressing on each piece of equipment shown on the HMI display individually, and pressing the corresponding AUTO button, or by pressing the SET ALL EQUIPMENT TO AUTO button on the HMI. If an alarm banner appears during an alarm condition, the operator can press the ALARM SILENCE button on the HMI to dismiss the alarm banner. If a plugging condition occurs, if the mill motor amperage exceeds or descends the “Mill motor current tolerance” for longer than the “Mill motor out of tolerance time”, the system will activate the dump valve for the “Dump gate activation time”. The system will then attempt to bring the mill back to operating conditions. This can occur three times within a programmable time frame before shutting down the mill and activating an alarm. If an overload occurs on the pellet mill motor, after the “Pellet Mill shutdown overload time delay” expires, the equipment will shutdown sequentially if the overload condition still exists. All equipment shutdown and will purge as described in the control systems’ shutdown sequence. An alarm will activate requiring user intervention.